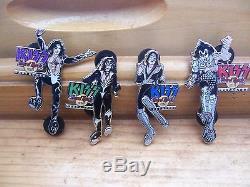 Here is a set of the Kiss Destroyer Hard Rock Cafe pins that came out in 2004. Very limited edition of only 300 of each pin. This is my only set. Almost impossible to find as a set. Only taken out of their packages for these photos. Not a stock photo, but the actual pins you will receive. The item "2004 Kiss Destroyer Hard Rock Cafe Pins LE 300 Complete Set Gene Ace Paul Peter" is in sale since Friday, June 1, 2018. This item is in the category "Entertainment Memorabilia\Music Memorabilia\Rock & Pop\Artists K\Kiss\Other Kiss Memorabilia". The seller is "kisstan" and is located in Berlin, New Hampshire. This item can be shipped worldwide.